By Shaunna Evans Leave a Comment · This content may contain affiliate links. As we get closer to Valentine’s Day hearts begin popping up everywhere and the world seems to become covered in red, pink, and purple. 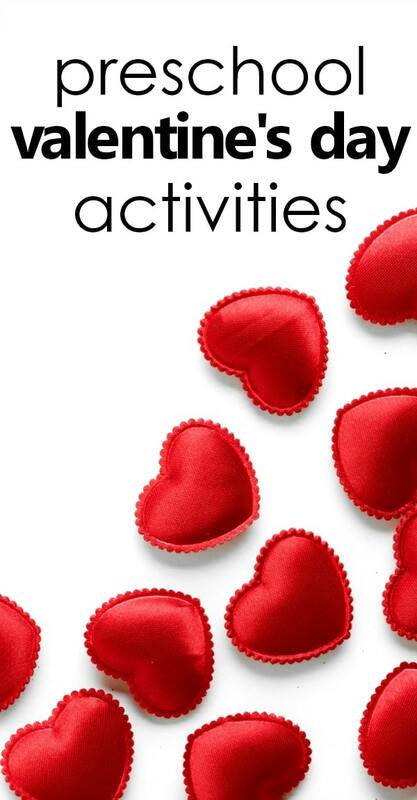 There are so many fun valentine’s day activities for kids, and there are tons of different approaches you can take to the holiday. 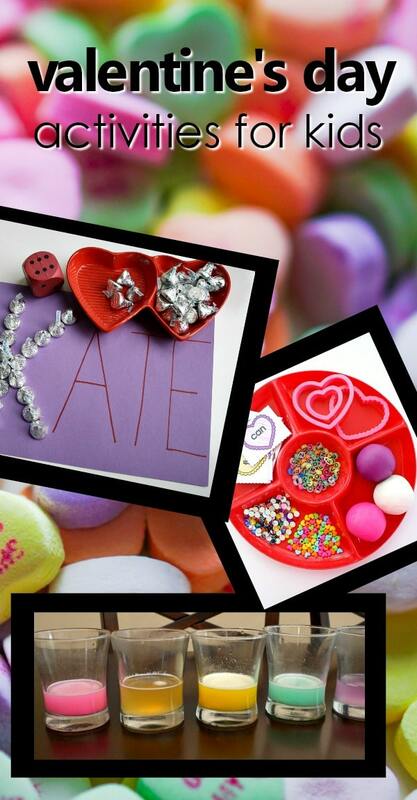 Here are some fabulous resources for planning your preschool Valentine’s Day theme. Most of these activities are designed for kids ages 3 through 5, but many can be modified for younger and older kids as well. With all the excitement of candy and sharing special gifts, the anticipation for Valentine’s day quickly builds. 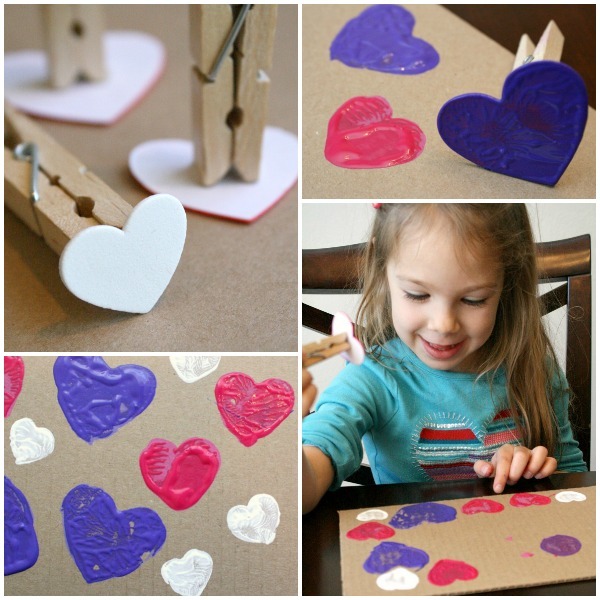 Kids will enjoy making homemade valentines for friends. And candy is definitely motivating for little ones. Many of the Valentine candies make terrific manipulatives for learning games or science experiments, leading to many opportunities for play and learning. Since Valentine’s Day is always on February 14, you can decide how far in advance you want to spread out your activities. Some people prefer to spread them over the first two weeks of February with a culminating activity on Valentine’s Day. Others like to save everything for one Valentine’s celebration on February 14. We tend to spread our activities out over at least a week so we can fully explore the concepts and have time for different crafts and pretend play activities. Choose the approach that best meets your kids’ interest level and the requirements of your program if necessary. 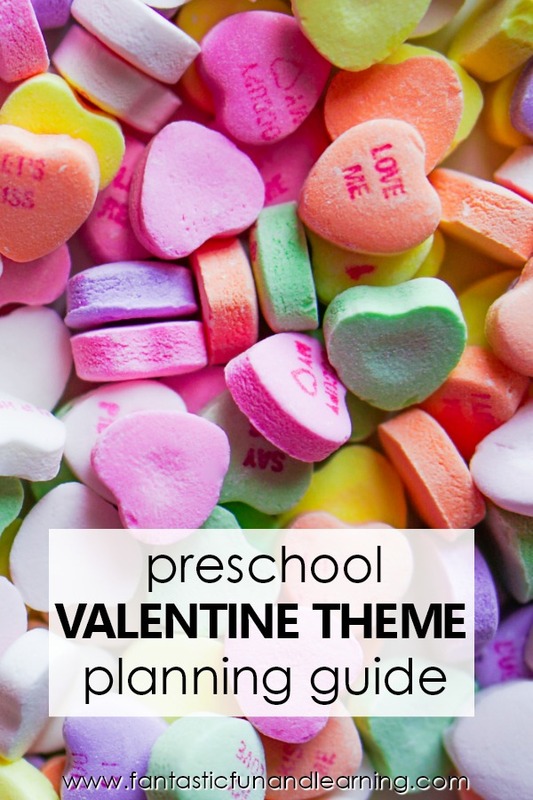 If you’re planning a preschool Valentine’s Day theme, there are many possibilities for incorporating meaningful early learning skills. 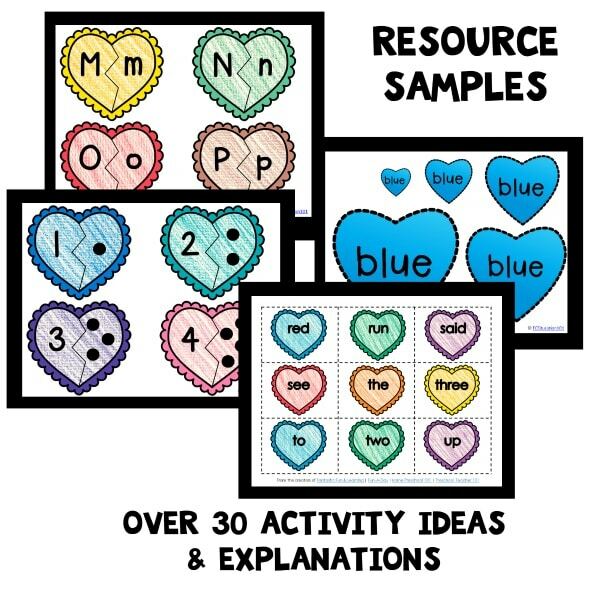 You can also use heart or cupid manipulatives for many learning activities to teach math and literacy concepts. If you get parents, friends, and family involved you can enrich the experience kids have during your preschool Valentine’s Day theme. 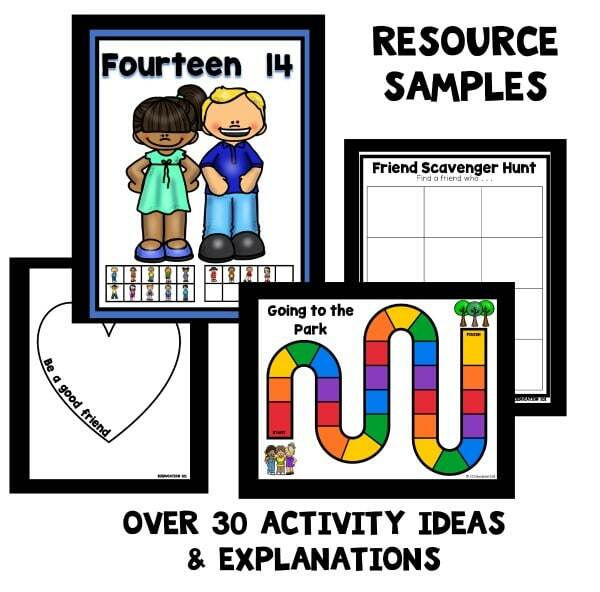 Save time and get right to the playful learning with our printable lesson plan sets. Each set includes over 30 playful learning activities related to the theme, and we’ve provided different versions for home preschool families and classroom teachers so all activities are geared directly toward your needs. Also available on Teachers Pay Teachers. In our full Roll and Color Heart Math set there are 16 roll and color math games for early math skills from preschool through first grade. Inside our February writing journals you’ll get writing prompt ideas for Valentine’s Day and Friendship, along with some additional topics for the month. 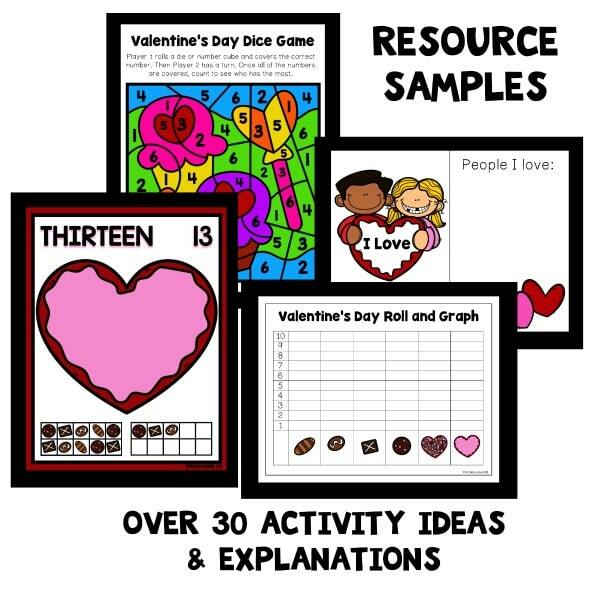 Practice Valentine’s Day math with our Valentine’s Day number sense activity pack full of hands-on math activities for preschool and kindergarten. Here on Fantastic Fun and Learning we’ve shared the following ideas to go along with a preschool Valentine’s Day theme. This cupid’s arrow Valentine’s Day snack is sure to be a healthy hit! 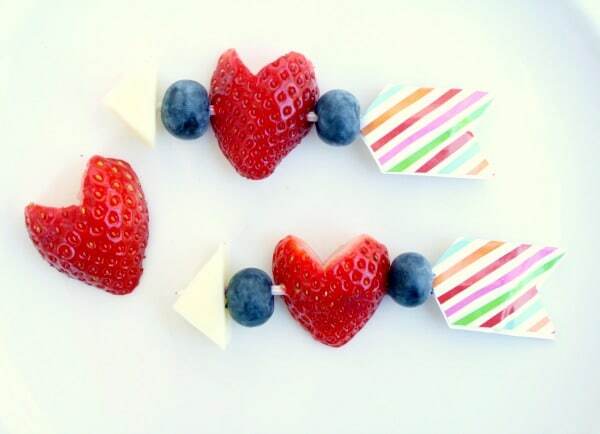 Make some kid-made valentines with this “You’re Berry Sweet” themed idea. Work those fine motor muscles as you play with this fun sorting “chocolates” activity. Use flower petals as paintbrushes to paint beautiful process art. Using only a few simple materials, you can create a three-dimensional heart as a Valentine’s Day craft. 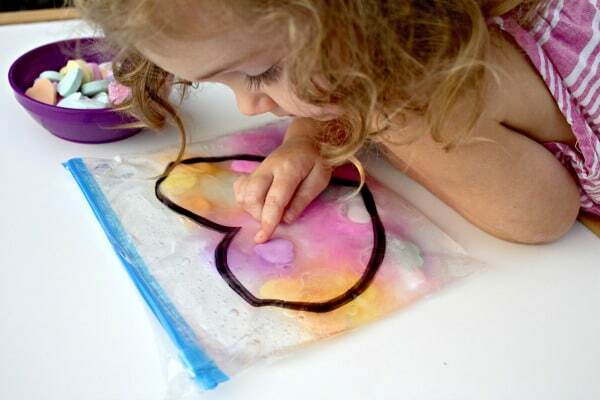 Decorate wrapping paper, create patterns, or just create some process art with this DIY heart stamping craft. 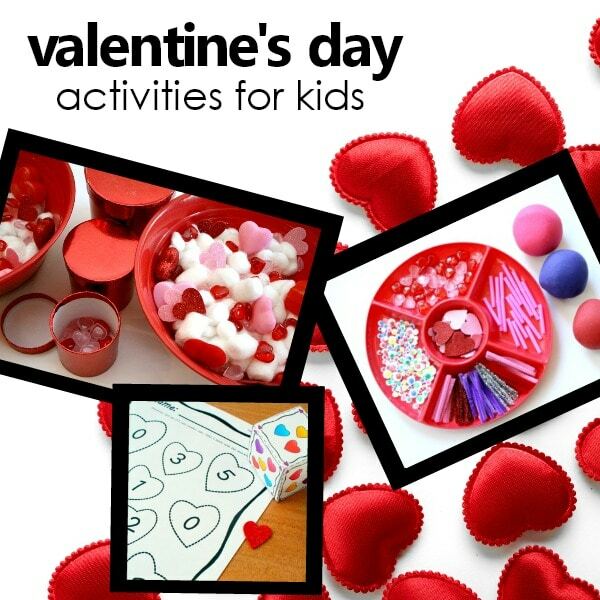 Set out an open-ended Valentine’s Day arts and crafts station for your little ones to create whatever their hearts desire! 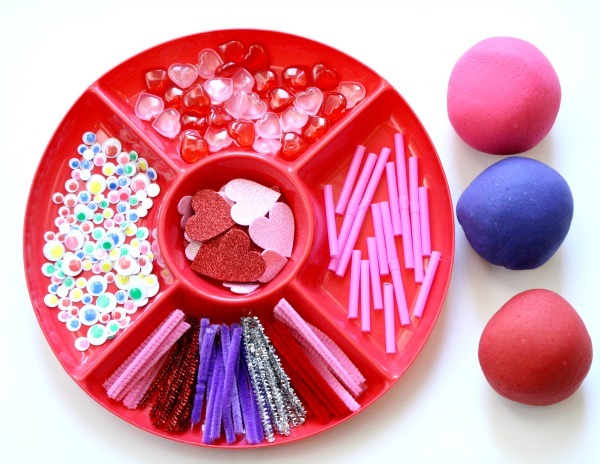 Squish and explore with this candy heart sensory bag science activity. Create a heart shaped sun catcher to admire this Valentine’s Day using absolutely no contact paper. Enjoy some sensory exploration and fun with this Valentine’s Day themed water play sensory bin. Have fun making these adorable play dough love bugs in a hands-on way. Just grab some play dough and loose parts. 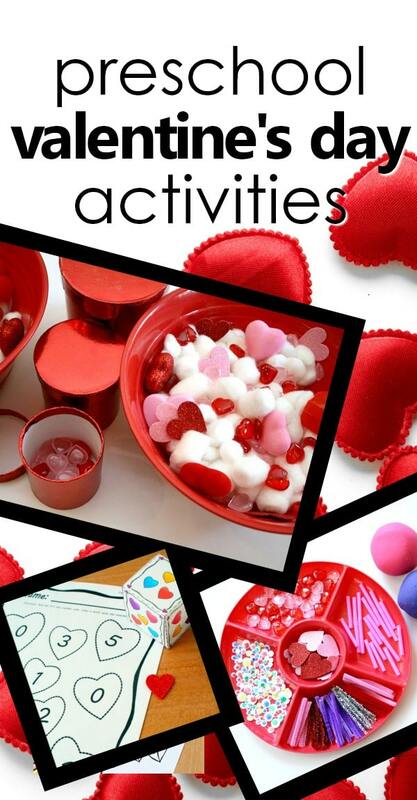 Involve the senses this Valentine’s Day as you explore this Valentine’s Day sensory bin. Children can practice sorting, counting, transferring and pouring, and even work on language development. 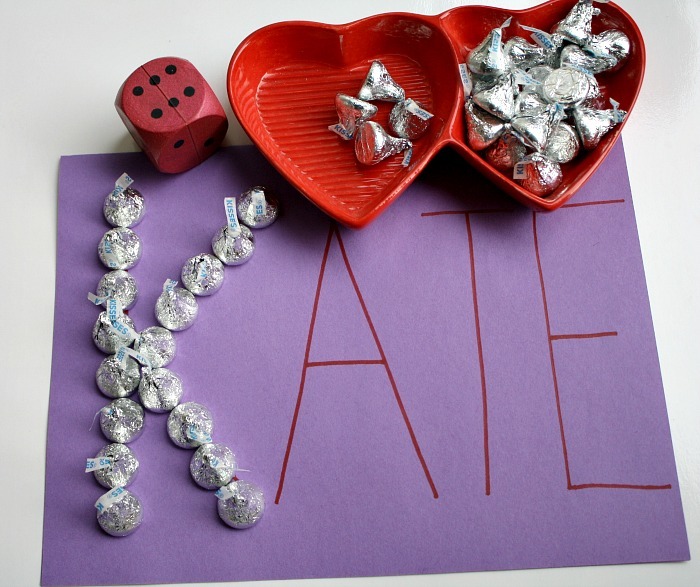 Practice name recognition, counting, and one-to-one correspondence with this chocolate kisses name game. Using candy conversation hearts, explore the science behind dissolving matter with this exciting and colorful conversation heart science experiment! 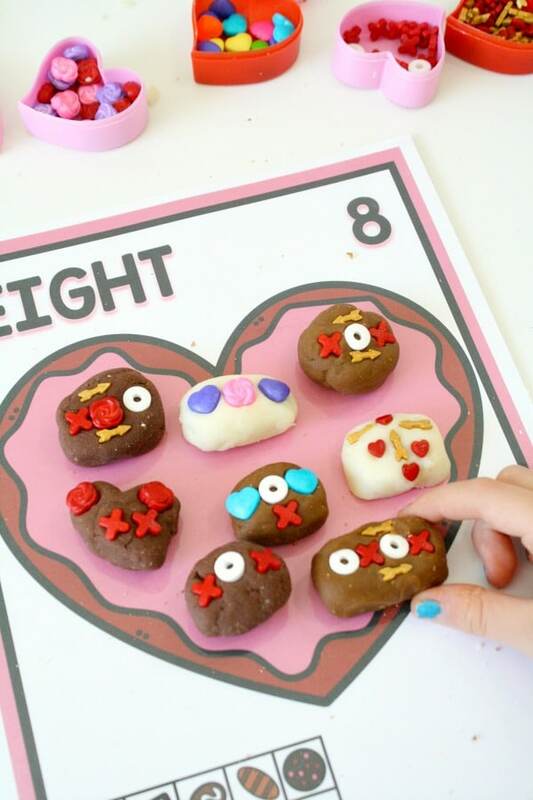 Little chocolate lovers will have so much fun making their own play dough valentine chocolates for pretend play and math activities. Get ready to explore science with this painted salt heart sculpture activity. 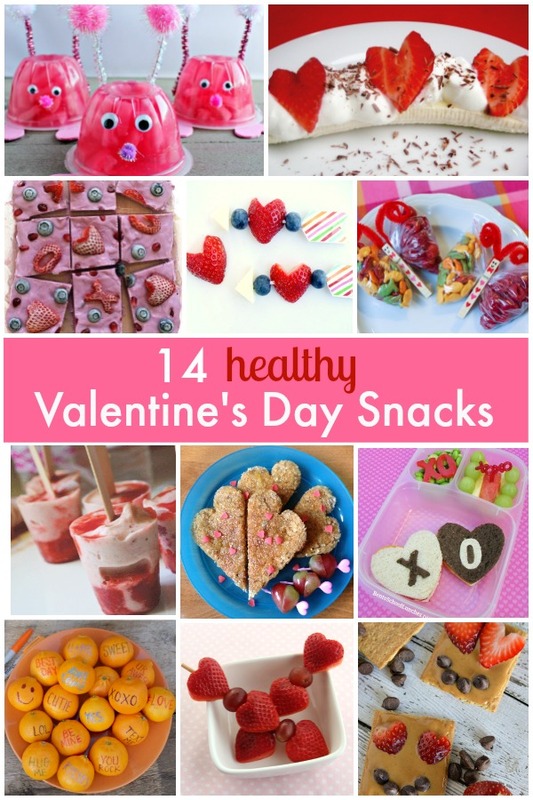 Check out some of these healthy snacks for Valentine’s Day for your class party, gathering, or school snack. 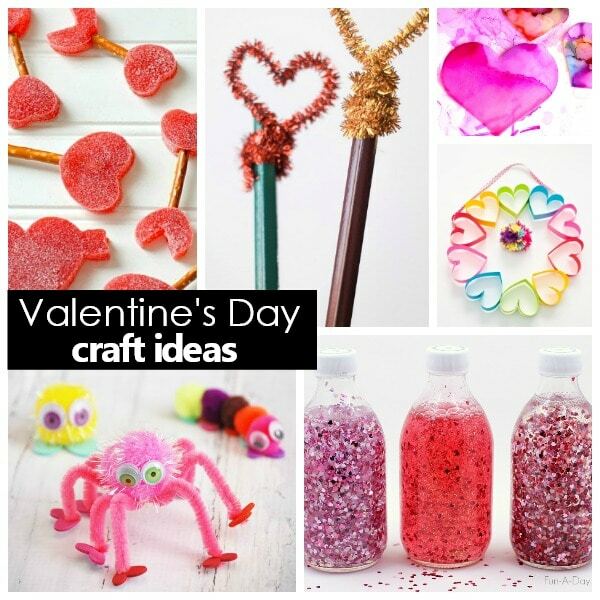 We’ve gathered some of the cutest Valentine’s Day crafts you can find to celebrate the holiday! For even more Valentine’s Day craft inspiration pop over to read this guest post from Red Ted Art. 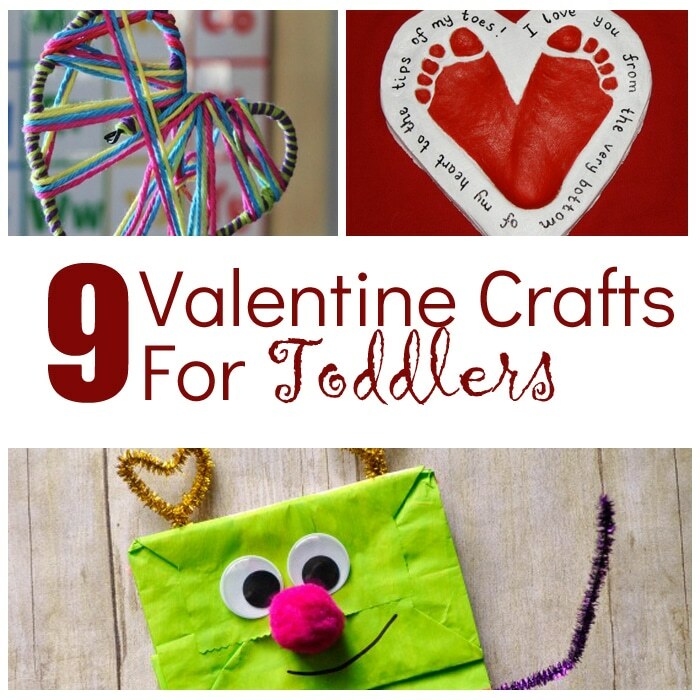 It’s full of adorable crafts for toddlers and preschoolers. Have you been bitten by the love bug? 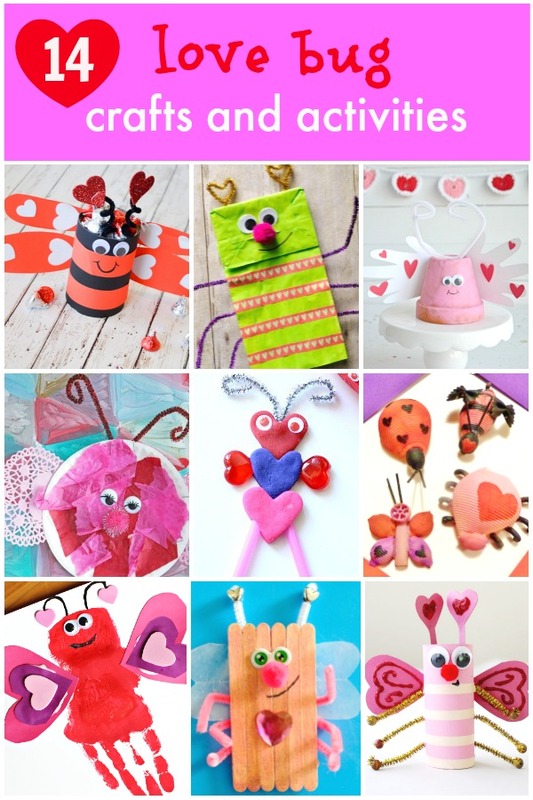 Check out these fun love bug art and craft activities this Valentine’s Day! 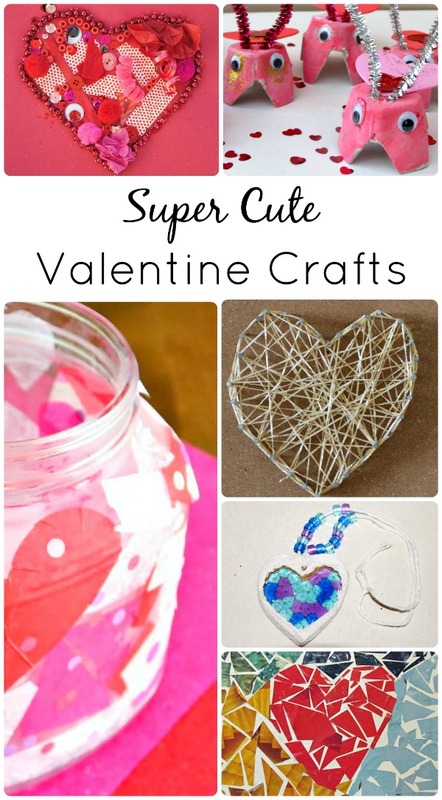 Find even more Valentin’es craft ideas in this collection of creative Valentine’s Day crafts for kids. 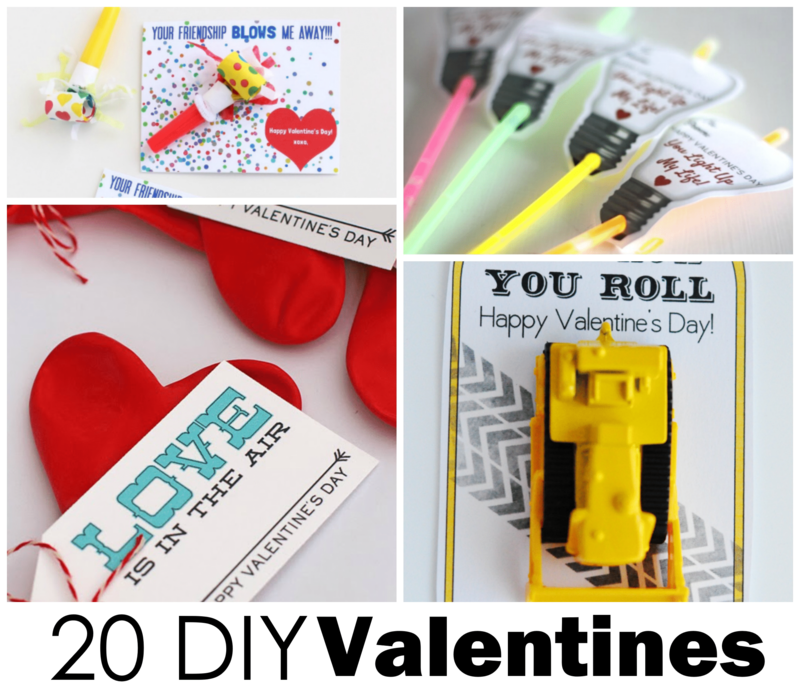 Looking for some creative DIY valentines? We’ve gathered 20 great valentines you can make at home. Learn some interesting facts about Valentine’s Day. Clap and sing along to this Valentine’s Day twist on B-I-N-G-O. Kids will love singing along to the classic favorite, Skidamarink. If You Love Me and You Know It is a great song for little ones to learn to sing to their family members. Get kids thinking and talking about things they love with this fun beat. Practice color recognition with Valentines, Valentines, What Color Do You See? Kids have fun using different voices and acting out this finger play. Finger plays and action rhymes are a great addition to your preschool themes. The following websites have lengthy lists of Valentine’s songs. Choose one or two favorites to sing with your kids. Primary Games has a wide variety of online Valentine’s Day games. 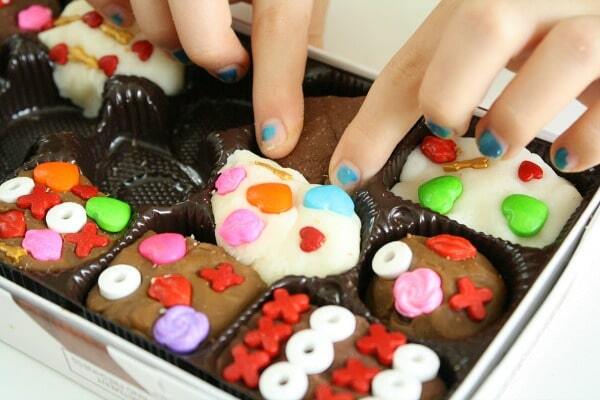 Match chocolates to chocolate boxes with the Valentine’s Day puzzle game from ABCya. 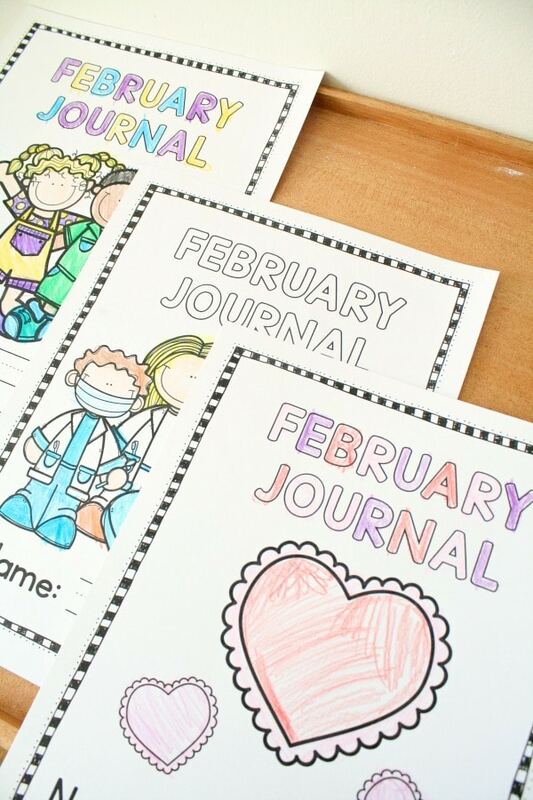 Find Valentine’s Day games, episodes and printable activities over on PBS Kids. There are a ton of wonderful books to read for your Valentine’s Day theme. Below are some of our favorite picture books for a Valentine’s Day theme. Whenever we can we try to include some nonfiction books in our early learning themes. These books will help your little ones learn more about Valentine’s Day and some of the items we associate with the holiday…like chocolate! Valentine’s Day can also be a wonderful time to talk with kids about friendship. 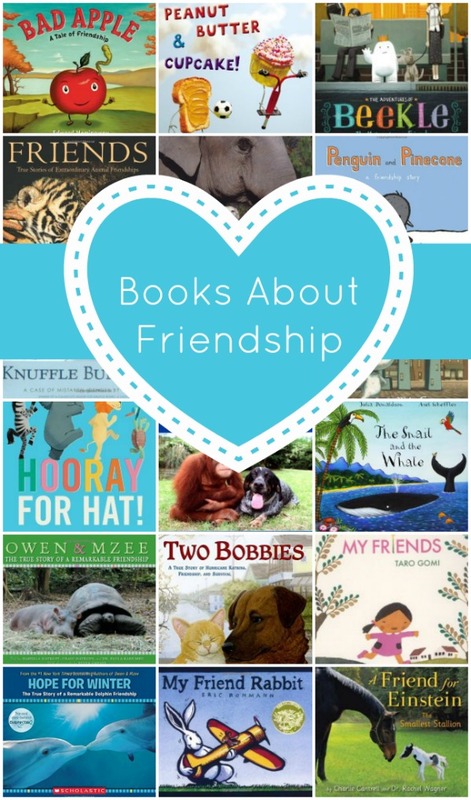 Here are some picture books about friendship to help guide your discussions. 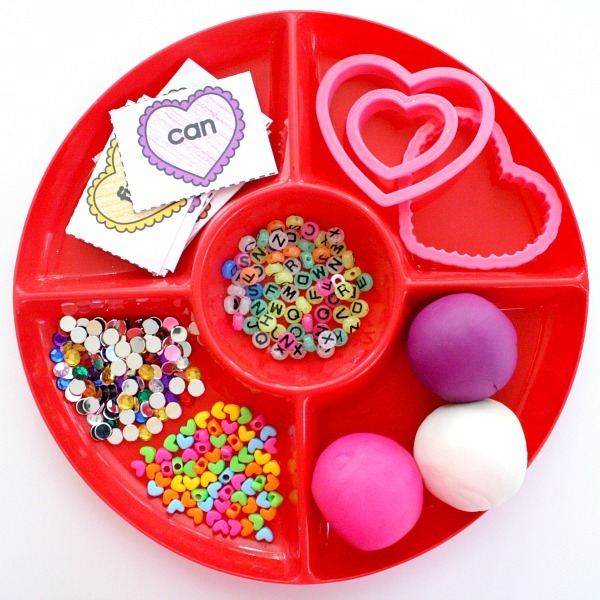 Reinforce learning with these hands-on materials for your Valentine’s Day theme. They can be used for sensory bins, crafts, and learning activities. Grab these free printables to add to your Valentine’s Day activities. 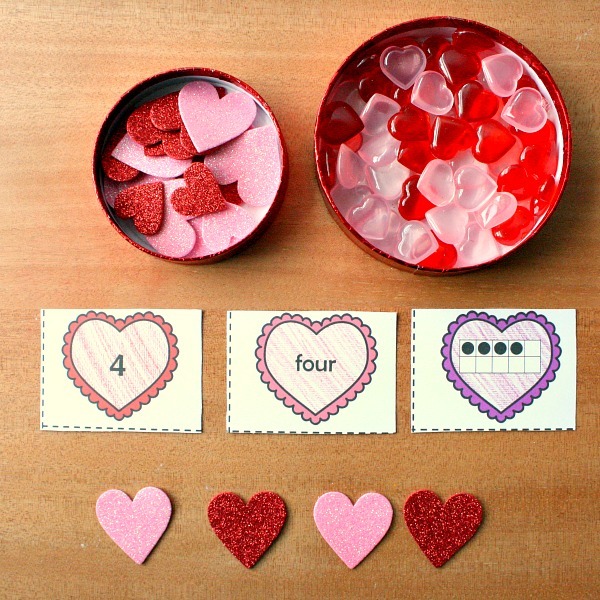 These Valentine’s Day printable number cards will help your little mathematician view numbers three different ways: number form, word form, and in a ten-frame. Brush up on adding doubles with this free Valentine’s Day math printable. 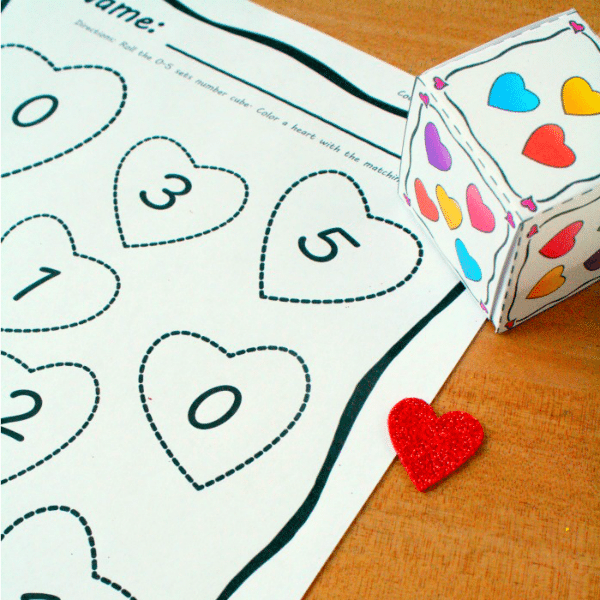 Check out these Valentine’s Day dice games with free printables. 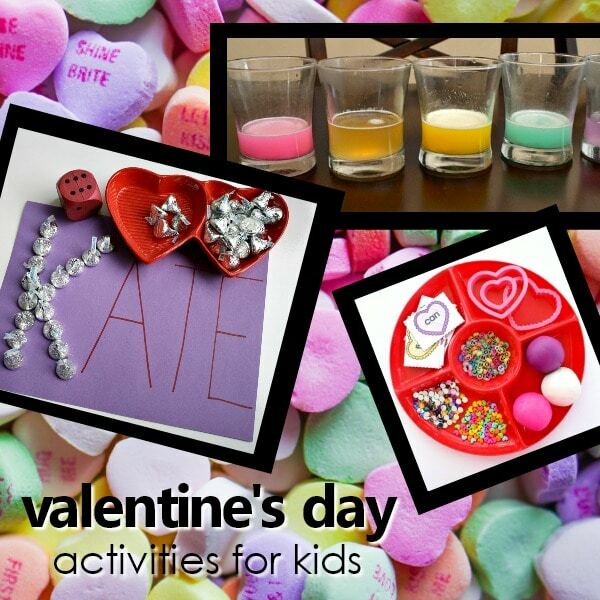 Exercise those fine motor muscles as you create valentine chocolates. 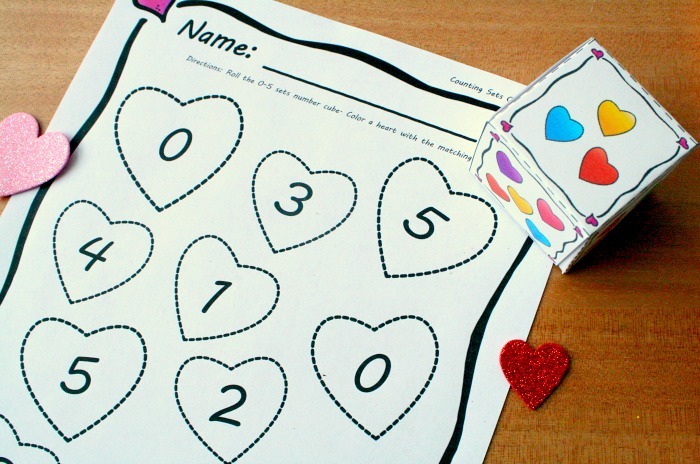 Then use these free printable heart counting mats to work on number recognition and counting sets. 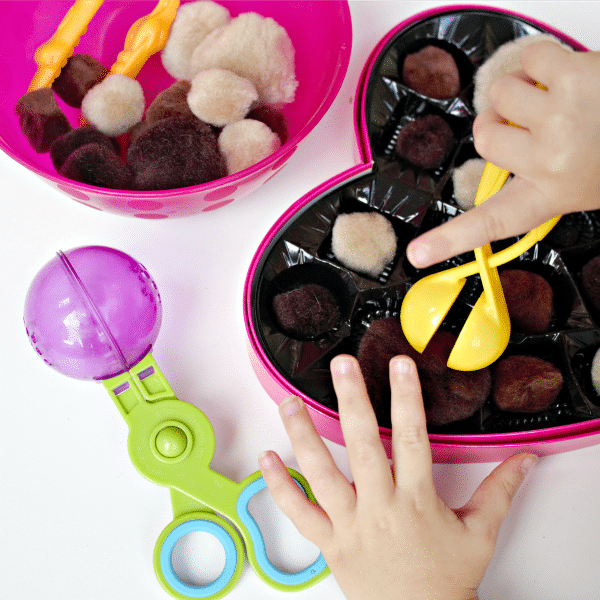 Use chocolate kisses to make 2D shapes with free printable Valentine shape mats. This sorting candy kisses math activity is perfect for toddlers and preschoolers to practice basic math skills. A sorting by color printable is included! Extend your fun and learning with candy kisses by graphing the chocolates by color. The free printable will help visualize the differences in quantity. Practice combining sets and early addition with this hands-on simple addition candy kisses math activity and free printable. 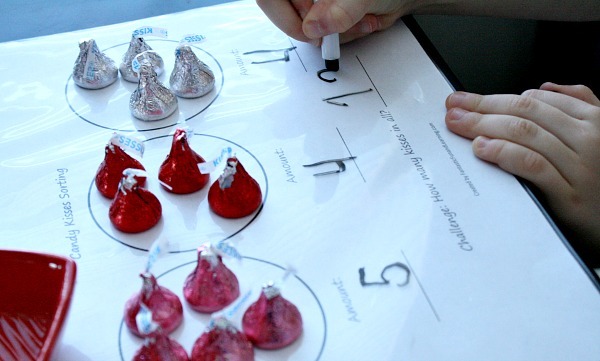 Have fun measuring perimeter with this hands-on candy kisses math activity with printable. Continue to explore nonstandard measurement as you measure length with candy kisses. Free printable included! Practice counting sets and matching corresponding numbers with this printable Valentine’s Day themed roll and color math game. Work on sight word recognition and building in a hands-on way with this play dough sight word activity. 40 pre-primer sight words are included as a printable! As you wrap up your preschool Valentine’s Day theme take note of what the kids were most interested in throughout the theme. Continue on by investigating one of those concepts more in depth. You might also consider beginning to explore some spring themes as spring gets closer. Below are some possible suggestions. Themes we have printable lesson plans for include links after them. Welcome to Fantastic Fun and Learning. Here you'll find plenty of great ideas for fun learning activities and things to do with kids.